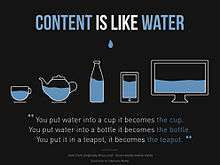 Content is like water, a saying that illustrates the principles of RWD. There are now many ways of validating and testing RWD designs, ranging from mobile site validators and mobile emulators to simultaneous testing tools like Adobe Edge Inspect. The Chrome, Firefox and Safari browsers and the Chrome console offer responsive design viewport resizing tools, as do third parties. Mashable called 2013 the Year of Responsive Web Design. Many other sources have recommended responsive design as a cost-effective alternative to mobile applications. 1 2 3 Marcotte, Ethan (May 25, 2010). "Responsive Web design". A List Apart. ↑ "Ethan Marcotte's 20 favourite responsive sites". .net magazine. October 11, 2011. 1 2 Gillenwater, Zoe Mickley (December 15, 2010). "Examples of flexible layouts with CSS3 media queries". Stunning CSS3. p. 320. ISBN 978-0-321-722133. ↑ Pettit, Nick (August 8, 2012). "Beginner's Guide to Responsive Web Design". TeamTreehouse.com blog. ↑ "Core concepts of Responsive Web design". September 8, 2014. 1 2 Marcotte, Ethan (March 3, 2009). "Fluid Grids". A List Apart. 1 2 Marcotte, Ethan (June 7, 2011). "Fluid images". A List Apart. ↑ Hannemann, Anselm (September 7, 2012). "The road to responsive images". net Magazine. ↑ Jacobs, Denise (April 24, 2012). "50 fantastic tools for responsive web design". .net Magazine. ↑ "Cisco Visual Networking Index: Global Mobile Data Traffic Forecast Update 2014–2019 White Paper". Cisco. January 30, 2015. Retrieved August 4, 2015. ↑ "Official Google Webmaster Central Blog: Rolling out the mobile-friendly update". Official Google Webmaster Central Blog. Retrieved August 4, 2015. ↑ Thevenin, D.; Coutaz, J. (2002). "Plasticity of User Interfaces: Framework and Research Agenda". Proc. Interact'99, A. Sasse & C. Johnson Eds, IFIP IOS Press. Edinburgh. pp. 110–117. ↑ "What is Responsive Web Design". July 23, 2012. 1 2 Firtman, Maximiliano (July 30, 2010). Programming the Mobile Web. p. 512. ISBN 978-0-596-80778-8. 1 2 "Server-Side Device Detection: History, Benefits And How-To". Smashing magazine. September 24, 2012. ↑ "BlackBerry Torch: The HTML5 Developer Scorecard | Blog". Sencha. August 18, 2010. Retrieved September 11, 2012. ↑ "Motorola Xoom: The HTML5 Developer Scorecard | Blog". Sencha. February 24, 2011. Retrieved September 11, 2012. ↑ Wroblewski, Luke (May 17, 2011). "Mobilism: jQuery Mobile". 1 2 Wroblewski, Luke (February 6, 2012). "Rolling Up Our Responsive Sleeves". ↑ Wroblewski, Luke (March 14, 2012). "Multi-Device Layout Patterns". ↑ Wroblewski, Luke (February 29, 2012). "Responsive Design ... or RESS". ↑ Wroblewski, Luke (September 12, 2011). "RESS: Responsive Design + Server Side Components". ↑ Andersen, Anders (May 9, 2012). "Getting Started with RESS". ↑ "Responsive but not completely mobile optimised | Blog". Incentivated. ↑ "Building Smartphone-Optimized Websites". Google. ↑ Snyder, Matthew; Koren, Etai (April 30, 2012). "The state of responsive advertising: the publishers' perspective". .net Magazine. ↑ "Google Partners Help". google.com. Retrieved May 21, 2015. ↑ "The Role of Table Layouts in Responsive Web Design". Web Design Tuts+. Retrieved May 21, 2015. ↑ Young, James (August 13, 2012). "Top responsive web design problems... testing". .net Magazine. ↑ "Best mobile emulators and RWD testing tools". The Mobile Web Design Blog. November 26, 2011. ↑ Rinaldi, Brian (September 26, 2012). "Browser testing... with Adobe Edge Inspect". ↑ "Responsive Design View". Mozilla Developer Network. Retrieved May 21, 2015. ↑ Malte Wassermann. "Responsive design testing tool – Viewport Resizer – Emulate various screen resolutions - Best developer device testing toolbar". maltewassermann.com. Retrieved May 21, 2015. ↑ Adams, Cameron (September 21, 2004). "Resolution dependent layout: Varying layout according to browser width". The Man in Blue. ↑ "G146: Using liquid layout". w3.org. Retrieved May 21, 2015. ↑ "Media Queries". w3.org. Retrieved May 21, 2015. ↑ "OutSeller Group - Organize, Optimize, Maximize". outseller.net. Retrieved May 21, 2015. ↑ "15 top web design and development trends for 2012". .net magazine. January 9, 2012. ↑ Cashmore, Pete (December 11, 2012). "Why 2013 Is the Year of Responsive Web Design".